For 37 Senior Technical Assistant, Junior Technical Assistant Vacancies, Konkan Railway Recruitment 2018 Notification is released by the officials of Konkan Railway Corporation Limited (KRCL). So, if you are also looking for a job opportunity then this chance is for you. Check the complete information. And then decide it to yourself. Well, the officials in the notification specified that they are conducting the Walk-in Interviews. So, starting from 19th November 2018, the Walk-in’s will start. And 12th December 2018 is the final date of the interview. So, please go through all the details and requirements and then decide by yourself, if you want this opportunity or not. To attend the Walk-in-Interview, an individual should have all the Qualifications correctly, then only they can attend the Interview. If not the officials will not consider you in participating in the process. Well, the job location of this Konkan Railway Recruitment 2018 is in Jammu and Kashmir. This is a great opportunity for all those people who are searching for the Government Jobs. Having all the Requirements are very important. This is why in the coming sections of this post, we are providing the total details about all the things. So, please check them, candidates can have the overall idea. Full-time Engineering Degree (BE/B.Tech) in Electrical /Electronics/ Power Electronics/Industrial Electronics With not less than 60% marks from recognized University approved by AICTE or Full time Diploma in Electrical / Electronics / Micro processor / Industrial Electronics / TV Engineering / Fiber Optic Communication / Electronics Instrumentation / Communication. Age of the applicants can be between 25 years to 30 years. Candidates will be hired based on their performance in Written Examination and Interview. Then go through the requirements properly. If you are eligible and interested, go to the following address according to the above-mentioned dates with all your documents. Hope the details covered about the Konkan Railway Recruitment 2018 Notification is helpful for the candidates searching for the Government Jobs. Get more such detailed data about various Govt opportunities by following our site Freshers Now. Konkan Railway Recruitment 2018-2019 Notification is released by the officials of Konkan Railway Corporation Limited (KRCL). So, all the people from the states like Goa, Maharashtra, Karnataka can check this article, to get the Latest Update about this trending Notification. Accordingly, the Officials of the Konkan Railway Corporation Limited are accepting the application forms for the Konkan Railway Recruitment 2018-2019. Therefore hurry up and apply before the final date. Apparently, all the people who are willing to utilize this chance can apply until 30th April 2018. Also, the officials of the organization are already started accepting. So, without wasting much time, try to check the information in advance and then proceed to apply. And at the time of applying, all the contenders must and should have the correct qualifications. If not the officials are going to reject the applications. Keep this in mind while applying. 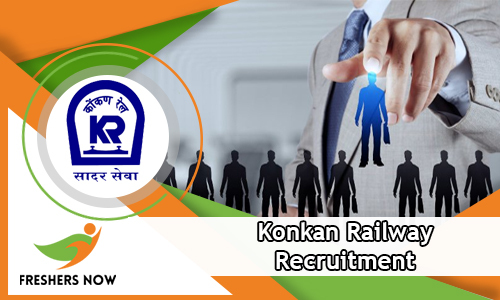 Konkan Railway Recruitment 2018-2019 Notification Clearly states that there is a total of 65 Vacancies. And these openings are for the Technician Positions. Therefore, the officials of the Konkan Railway Corporation Limited are expecting the application forms from the people who are eligible and have had all the qualifications correctly. Now, according to the data mentioned in the Konkan Railway Recruitment 2018-2019 Notification, all the people need to finish their Matriculation/SSLC plus ITI from recognized institutions of NCVT/SCVT / Matriculation/SSLC plus CCAA in the relevant Trades from any of the Recognized institutes or Universities in India as the Educational Qualification. Please note that having this as the correct educational Qualification at the time of applying is very important. If not the officials are going to reject your application form, keep this in mind and proceed to find out other details. Check next sections of this post for more information. Please find important data about the Konkan Railway Recruitment 2018-2019 Notification through the above table. Now, the table consists of information such as the Name of the organization, Number of Vacancies Available, Name of the Vacant position and all. Also, along with that, you can find data such as the Starting Date to apply, Closing date to apply, Mode of Application submission, Category, an Official website to check the information. Along with all these, in this particular article about the Konkan Railway Recruitment 2018-2019, all the people can get data about the Educational Qualification, Selection Process, Salary, Age Limit, Age Relaxation, Application Fee. Apart from these, we are also giving some simple steps in the next sections. And those will guide all the interested people, to apply before the closing date. Now, the important thing along with the educational Qualification, that all the people need to know is Age. So, as per the information in the Konkan Railway Recruitment 2018-2019, all the contenders need to have the correct age. Basing on the data in the Konkan Railway Recruitment 2018-2019 Notification, Minimum Age can be 18 years. While the officials mention that the maximum age of 38 years is also acceptable. The Officials of the Konkan Railway also gave the exemption through Age Relaxation. This will differ according to the category. So, check this article further or go through the Konkan Railway Recruitment 2018-2019 Advertisement, attached at the bottom of this Age Relaxation information. Having the correct age along with the Educational Qualification is quite mandatory. So, keep this in mind, while going ahead to apply for the Konkan Railway Recruitment 2018-2019. Next in the list of requirements comes the Application Fee. Well, each and every contender should pay the Application Fee, that is already set the officials. So, according to the data in the Konkan Railway Recruitment 2018-2019 Notification, people need to pay Rs.500/- if they are from other categories. Also, the officials clearly mention that the people from the SC/ST/Ex-Serviceman should Pay Rs.250/- as the Application Fee. Try to check the official Konkan Railway Recruitment 2018-2019 Notification or the official site of the organization while making the payment. Also, the aspirants can make the payment of the Examination fee through the internet banking or debit/credit cards. Remember you have to pay the application fee by the closing date. Then only your application form is acceptable. Now, after submitting the application form for the Konkan Railway Recruitment 2018-2019, the officials are going to review them. And then they are going to invite the people to take part in the Recruitment Rounds. Remember that the merit shown in those rounds are counted. Therefore, all the people should note it down, while preparing. According to the Konkan Railway Recruitment 2018-2019 Notification, all the eligible people have to attempt the Recruitment Rounds. And it consists of Computer Based Test along with the Document Verification. Remember you can go to the Document Verification only if you clear the CBT. Now, the selected contenders are going to get the monthly salary. And the pay scale will be as per the terms of the organization. But we can assure you all that the pay will be best in the industry. Also, at the end of this post, we even attached the official Konkan Railway Recruitment 2018-2019 Notification. Just click on that link, you can download the notification. Ex-Servicemen: Up to the extent of service rendered in Defence plus 3years provided they have put in the minimum of 6 months service after attestation. Initially, go to the official site of the Konkan Railway Corporation Limited at konkanrailway.com. Want to find more sources such as the Konkan Railway Recruitment 2018-2019 Notification? then you should check our site Freshersnow.com on daily basis.